On one side side of this flexi is a recording by Hans Wesseling and friends. A very typical piece of music for those days, but not for Holland: I don’t know any other record that comes close to this. Which does not mean that I think that this is great music, but it sure is unique. On the other side is a poem by Le-Roi Jones, entitled Black Dada nihilismus . I have no idea why this poem is on the other side of a Dutch record, and the sleeve gives no explanation either. I will show you both sides of the sleeve, and both the labels too. I would appreciate if anybody could tell me more about this flexi record. My god, that’s excellent stuff. Thanks you very much for sharing. My guess: late 60’s leftwing, politically inspired hippies. Maybe that’s why the only reference I could find to this record is in the library catalog of the Internationaal Instituut voor Sociale Geschiedenis. Wesseling c.s. probably found it hip to add a track by LeRoi Jones to their release. Jones was already known as a policital activist back then, although he hadn’t changed his name to Amiri Baraka at that point. Interesting to note is the link between Wesseling and the infamous Groep 1850. And Baraka of course is known for his collaboration with Sun Ra of his “A Black Mass”. Marco, what a great article! Thanks for finding that. I am impressed by what is said here. Hans Wesseling is now added to my list of heroes. I traced Ernst Cats while doing research for my book on artist records. He doesn’t remember much about the recording itself, unfortunately. In 1969 Ernst and Wijnand Mens – who still consider themselves ‘spiritual seekers’ – moved to France where they joined the Ashram Centre Védantique Ramakrishna. Besides meditating and singing they composed a Bhajan which was released on an album in 1970. Ernst Cats currently lives in Holland and works as a sculptor. Wijnand Mens runs a puppet theatre for which Ernst wrote some scores. You must have come across the name Enno Velthuys while doing your Radiola research. I believe he’s also the son of Max Velthuijs, the author of childrens books (Kikker). 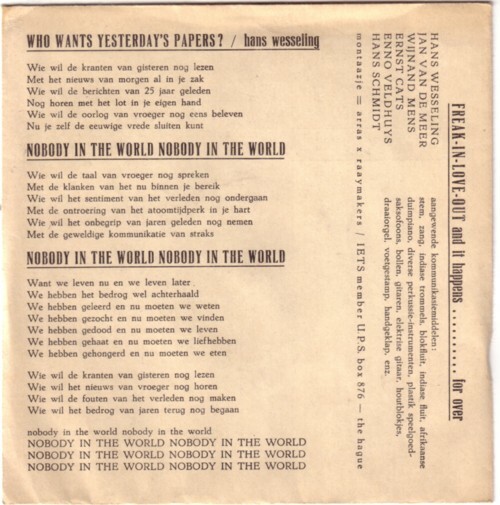 Together with Simon Vinkenoog and Fluxus artist Bob Lens, Hans Wesseling recorded the LP “Woorden”. It’s one of my all-time favourite Dutch records and even appears on the Nurse With Wound list. dag, ik kwam hier terecht omdat ik probeerde uit te zoeken wat ik voor eigenaardig vinyletje in mijn verzameling ‘eigenaardig’ had. Ik wil het wel kwijt, maar waar kan ik het ‘t best aanbieden?